Add on type LED lighting options can add light or act as stand alone lighting inside your trailer or RV. Strips are available in 3, 12, and 25 foot lengths and module lights come 2 pieces in a pack. All are long lasting, low amp draw 12 volt DC LEDs. The all new 36 inch Accent Strip LED light Kit utilizes 40 Hi-output wide dispersion flat LEDs to give more light and maximum flexability for installation. 3M brand two way adhesive allows the strip to be mounted almost anywhere. Work on any 12 volt charging system, with or without a battery. Strips can be cut with a sissor to desired length. If you want a switch, any standard low voltage (the cheap ones) will work fine. Just pick out the type you like (ie rocker, button, flip, etc. switch). Kit includes one 36" strip, mounting tape, and instructions. The all new 12 foot interior Strip LED light Kit utilizes SMC Hi-output wide dispersion flat LEDs to give more light and maximum flexability for installation. 3M brand two way adhesive allows the strip to be mounted almost anywhere. 210 LEDs, uses 27 watts, 2.0 amps and puts out 875 lumens per strip. Work on any 12 volt charging system, with or without a battery. Strips can be cut with a sissor to desired length. If you want a switch, any standard low voltage (the cheap ones) will work fine. Just pick out the type you like (ie rocker, button, flip, etc. switch). Kit includes one 12' strip, mounting tape, and instructions. 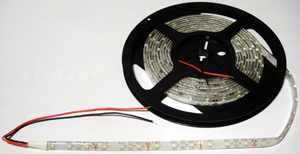 The all new 25 foot interior Strip LED light Kit utilizes SMC Hi-output wide dispersion flat LEDs to give more light and maximum flexability for installation. 3M brand two way adhesive allows the strip to be mounted almost anywhere. 450 LEDs, uses 59 watts, 4.4 amps and puts out 1875 lumens of light per strip. Work on any 12 volt charging system, with or without a battery. Strips can be cut with a sissor to desired length. If you want a switch, any standard low voltage (the cheap ones) will work fine. Just pick out the type you like (ie rocker, button, flip, etc. switch). Kit includes one 25' strip, mounting tape, and instructions.